The below artworks are the most important by Théodore Rousseau - that both overview the major creative periods, and highlight the greatest achievements by the artist. Artwork description & Analysis: The Descent of Cows from the High Plateaus of the Jura was one of Rousseau's most beautiful works. Yet, with chemical degradation, compounded by the passing of time, the colors in this painting, which was predominantly green, soon darkened. 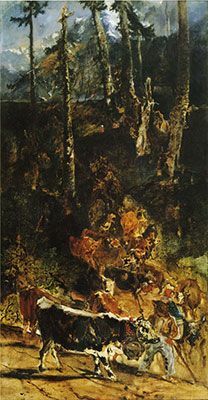 A cowherd leading a group of cattle down the rocky cliffs in the foreground and a thicket of trees reaching up to as well as obscuring most of the sky in the background are the components that are evident in this work even now. The artist here offers a completely different take on landscape painting wherein the composition is dramatically compressed and has a vertical orientation as opposed to the regular horizontal layout of the western landscape tradition. Although, art historian Albert Boime compares this work with Jacques-Louis David's painting Napoléon Bonaparte crossing the Alps at the Saint-Bernard Pass with similarly upright composition, an essential difference is that nature in Rousseau's painting is not treated as a mere background. This work is also boldly devoid of mythological or biblical narrative of Neoclassicism as well as the fantasy or imaginative mode of Romanticism and portrays nature for its own sake. No wonder then, that the painter was seen as a rebel of the genre and this work was rejected from the Salon of 1836. His explicit observation of nature paired with a technique of loose brushwork may have led the Salon jury to judge the work as unfinished, but it was this uniqueness that made him a leader in the field of landscape painting. Rousseau's innovative expression through this landscape painting was noticed and appreciated by a senior contemporary Romantic painter Ary Scheffer, who displayed it in his studio. Ironically then, the work that was refused by the Salon was reinstated within the lineage of 19th-century landscape. 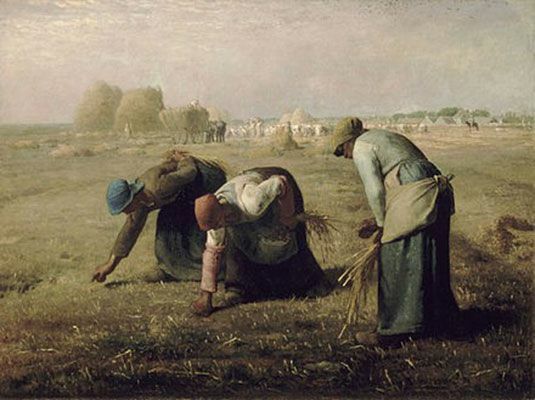 Also, the work that was criticized as lacking 'finish' became a major aesthetic precept to the next generation of artists, the Impressionists, who would revolutionize landscape painting. Artwork description & Analysis: An alley of ancient trees that are symmetrically arranged draws the viewer to the illusion of great depth. Sharp contrasts created by the dark greens give way to lighter tones of gold and yellow below; lead the eye further into the dense grove of the landscape. This work instills a sense of total immersion into the scene itself as if it were a theatrical backdrop. Rounded edges of the top portion enclosing twisted branches intertwining in a canopy above heighten this stage-like effect. Further, it is reminiscent of an architectonic composition as the thicket of foliage leaves no room for the sky above and is aptly likened by the critic Théophile Thoré to the high vaults of a Gothic cathedral. 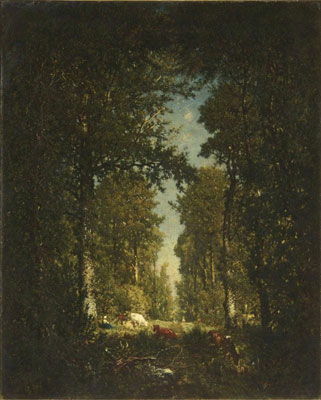 The Avenue of Chestnuts makes clear the abiding respect and affection for nature felt by Rousseau. He celebrates nature's glory by portraying the power and vigor of natural shapes and forms that renders the human form along the path barely visible, much like the viewer who is overwhelmed by the majesty of the trees. Rousseau began painting this work in 1837 in the park of Château du Souliers in the Vendee; which was owned by his friend Charles Le Roux's family. After toiling over the painting for many years, he finally submitted it to the Salon of 1841. 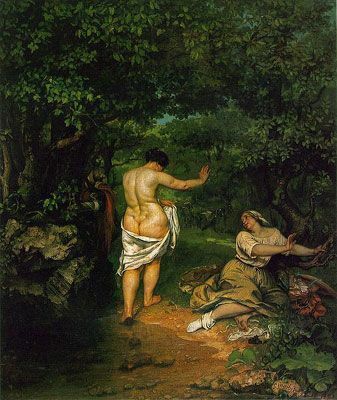 The jury's rejection of the painting came as a rude shock to the artist, as its sale to the State had been organized the previous year by none other than the Romantic master Eugène Delacroix and the novelist George Sand, who were influential in the political and artistic circles. Such an insult made Rousseau declare that he would no longer submit work to the Salon, a break that would carry on until after the Revolution of 1848. Yet he remained entwined in the French art world; for example, in a review of the Salon of 1845 by Thoré, the critic provides an in-depth analysis of this work and acclaims Rousseau's devotion to nature as he writes "The opening to the sky at the end of the mysterious alley is like a radiant altar at the rear of a gloomy monument. 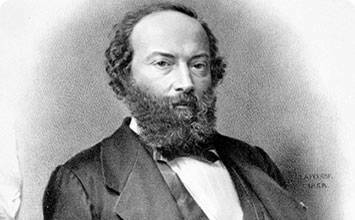 [...] Nature is the voluptuous mother who provokes her lover's passion, and art is the fruit of this union." One aspect that remained as a continual inspiration, and even progressed further throughout his career, was Rousseau's zeal for nature. It is illustrated here in a laudatory manner with the statuesque forms of the chestnut trees. 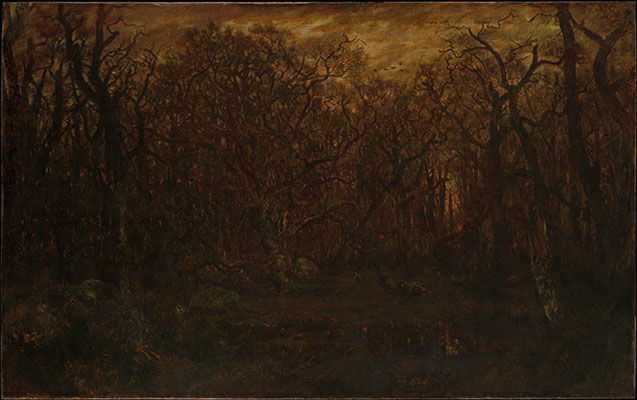 Artwork description & Analysis: This forest near the village of Barbizon had captivated the artist's heart long before the time of this painting. Shimmering rays of the golden sun set upon tree branches and the tufts of hair of a group of cows, drinking in peace from a still and quiet pond. It is as if Rousseau wanted to capture and amplify the glow of this scene within the natural frame of curvaceous oak tree branches. Using this compositional device that recalls a vignette, the artist provides a focal point for the viewer's gaze. 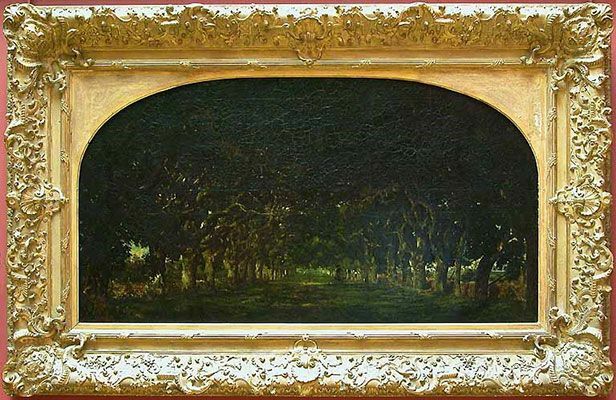 Art historian Greg H. Thomas, however, describes the somewhat unsettling effects of the painting, as he writes, "the viewer's view with trees which [threatens] to obscure the fragile human axis cut through them." Although the forest was managed by the Royal Forest Administration, Rousseau's canvas does not acknowledge human intervention in protecting nature. On the contrary, he seems to argue that human existence is overpowered by forces of nature and any effort to control it is in vain. Perhaps for this reason, the figure of a shepherd at the center of the picture plane seems to disappear into the landscape entirely. By the same token then, though the setting sun is warm and inviting, an air permeating melancholy can also be felt. After nearly a decade of rejection from the official art establishment, Rousseau was honored with a State Commission for the Musée du Luxembourg, delivered personally in 1848 by the Minister of the Interior and the Director of the Louvre. It resulted in this painting. Displayed first at the Salon of 1850-51 and then again at the Exposition Universelle of 1855, the painting finally bestowed upon Rousseau his long-awaited recognition and eventual ascent within the French art world. Though he would continue to extend the boundaries of landscape painting till the end of his life, his acceptance by Parisian art institutions ensured his visibility for and influence on the younger generation of Impressionists who would soon follow. Artwork description & Analysis: Having successfully ascended to the upper echelons of the art world, Rousseau returned to the vertical format of landscape with An Avenue of Trees, Forest of l'Isle-Adam. Earlier he was ridiculed and his work of 1836, Descent of Cows rejected for such a layout. This work was initially shown at the Salon with a different title: The Green Avenue or Avenue des Bonshommes. Described by Alfred Sensier as a 'Druidic Temple', the painting is exemplary of Rousseau's ability to express communion with nature like the beliefs of ancient Druids. The artist was known for his habit of painting directly from nature to which he would later add details and complete in his studio. This painting is an exception to his regular practice in that he worked on this painting entirely outdoors amidst trees and foliage. Although, he began painting in the spring of 1846 and continued to do so throughout that season while staying at l'Isle-Adam with fellow painter Jules Dupré, it remained unfinished until he returned to complete it in the following two years. It is amazing to note that despite the prolonged periods of rework he has managed to capture a seemingly photographic moment of the cows grazing under the watchful eye of the shepherdess. The transition of shadow to light creates a vignette-like effect of early photography. Through this work Rousseau may have felt the need to prove his painterly capabilities over and above that of photography, which was emerging popular at this time. He even chose the most difficult time of the day- the high noon- to create a scene that would be impossible to photograph. Exhibited at the Salon of 1849, the painting successfully demonstrates his mastery of rendering the diffusion of light as well as his penchant for depicting the harmonious coexistence of nature and humankind that is represented here as a figure seated unobtrusively and tranquilly. Rousseau's desire to live in serene, natural ambience materialized when he moved permanently to the village of Barbizon (bordering the Forest of Fontainebleau) in 1848. Theodore Rousseau's ideological quest or flight-into-nature aligns him with the views of philosopher, Jean-Jacques Rousseau, whose writing had a profound influence on many a Romantic artist. Artwork description & Analysis: Beneath a sapphire sky close to the horizon line, a traveler camouflaged within the shadow of a tree is seen between rows of thatch-roofed huts of this village, which seems to resonate with the echo of his loneliness. 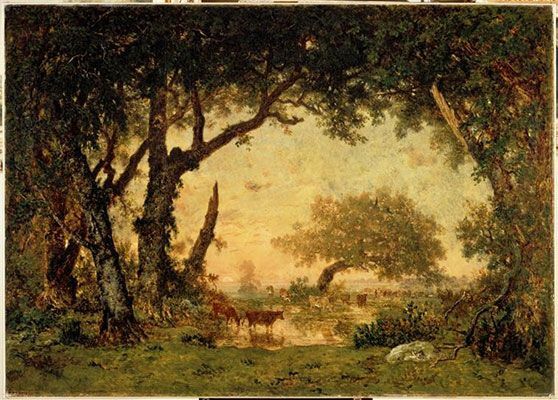 This painting is related to a travel that Rousseau took through Picardy in 1857 and was astounded when he saw this peaceful rural retreat. His approach here comes close to the works that project an interest in anthropological exoticism. He is nevertheless, conscious of avoiding over emphasis on human dwellings, so a distant view of the cottages makes them appear as hilly extensions of the uneven soils of the foreground. Compositionally, the cottages are arranged to connect the earth and sky and the trees are intelligently placed to break the monotony of a horizontal layout. Hence, Rousseau's Village of Becquigny is a veritable encyclopedia of his talents as a mature landscape painter. 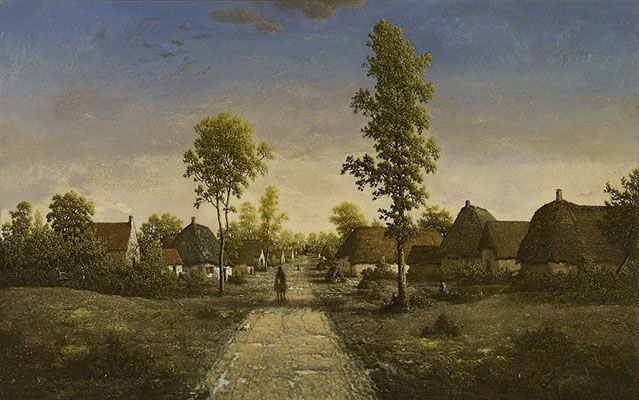 Often likened to Meindert Hobbema's Avenue at Middelharnis (1689), Rousseau's painting is exemplary of his ability to combine tradition and innovation. Due to his urge for novelty he repainted the whole sky a startlingly brilliant blue, inspired by the Japanese prints he recently came across, on the night before its exhibition at the Salon of 1864. When critics responded negatively to what they called an 'excess of invention', Rousseau returned the sky to its original, more harmonious state. Though it was purchased by a private collector in 1862, Rousseau was never satisfied with it, making adjustments to the painting until his death. 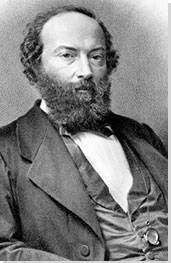 When advised by his friend and biographer, Alfred Sensier not to continue toiling with the canvas long after his return from Becquigny, he wrote in a letter, "Do not fear for my Village; if I put the finishing touches on it in Paris, its virginal impressions of nature will not be any less present to me; they date from long ago and cannot fade away." Though Rousseau was dedicated to studying nature, he could not completely espouse the principle of plein air painting as he prioritized perfection. He expressed this view with one of his students thus: "Your trees must cling to the ground, your branches must come forward or plunge into the canvas; the viewer must think he could walk around your tree." Artwork description & Analysis: From the dark depths of the earth rises a stormy web of trees and their tangled branches ensnaring everything within the canvas. Subtle modulations of pale and dry winter skies are punctuated by streaks of orange, red, icy blue and gray. Rousseau paints two tiny human forms in the center only to reiterate the insignificance, even hopelessness of human existence in the face of this enormous forest and its daunting winter. Rousseau began painting The Forest in Winter at Sunset in December 1846, when he was relatively young. 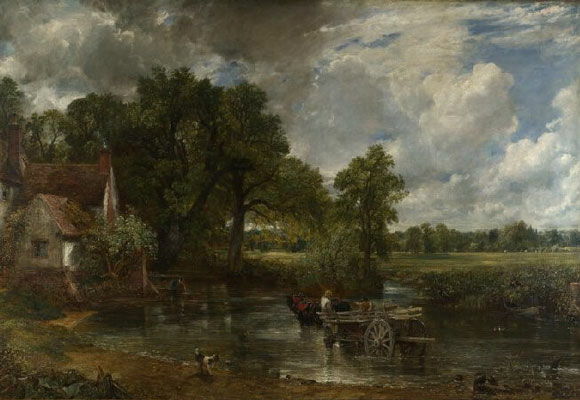 Yet in 1867 it was kept in his studio for the posthumous sale of his works and possessions, which may suggest that the work was still to be finished. Technical analysis and correspondence support this argument as they indicate that Rousseau returned to painting it time and again. The gnarled oak trees were a marker of the forest's ancient past for him and consequently the painting has an enigmatic, almost primordial air. Like many of his fellow Barbizon School painters, Rousseau's insistence on representing the landscape without any reference to mythological or historical narrative did not deter him from creating paintings that were rich with emotion and meaning. Thought-provoking, contemplative, and laden with sublime beauty, A Forest in Winter at Sunset is a summation of the painter's long and varied career.